Classic design, worthy update. Best of all, you can fit one on your pedalboard! Great, vintage dirt tones. Modern spec and build quality. You'll need a clean amp signal to get the best of it. 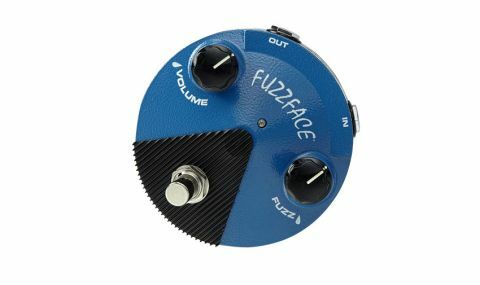 The Fuzz Face is one of the most iconic pedals of all time, and its enclosure - inspired by the base of a mic stand - has hardly changed since its introduction in 1966. But wouldn't it be great if you could actually fit one on your pedalboard? "2013 is the year the gnarly, nasty fuzz gets cute"
Fortunately, 2013 is the year the gnarly, nasty fuzz gets cute, with the Fuzz Face Mini FFM1 Silicon, one of a range of three we'll be reviewing (the others being the FFM2 Germanium and FFM3 Jimi Hendrix). Like the other pedals in the range, the FFM1 has modern-day appointments such as an AC power jack, bright-blue status LED, easy-access battery door and true bypass switching. And while the enclosure may be small, it's just as sturdy as ever. Circuit-wise, the blue FFM1 Silicon 'Face is based on a 1970 Fuzz Face, and claims a "bright and aggressive" sound courtesy of matched BC108 silicon transistors. It uses a modern, compact printed circuit board approach for its construction. "There's a noticeable mid scoop to the tones"
There's a noticeable mid scoop to the tones - it's not ideal for boosting an already overdriven amp, but alone it provides a vintage dirt that goes from a touch of hair to a spitty saturated sustain. As with all the new Minis, there's a dramatic shift in the last quarter of the gain range, and the same goes for your guitar's volume knob: turning down a couple of notches cleans up the dirtiest of Fuzz Faces because they're so sensitive to what's coming in the input. The payoff is that they often don't like other stompboxes in front of them, so keep 'em first on your 'board. The Dunlop Mini proves the versatility of the original Fuzz Face design while adding a few modern twists to the recipe.